Chris Forrester jumps over a tackle from West Brom's James McClean. Photo: Joe Dent/theposh.com. Peterborough United manager Graham Westley insisted his side were well worth their draw in their fourth round FA Cup tie at Premier League West Brom today (January 30). Posh fought back from a goal down twice in the final 11 minutes to draw 2-2 at the Hawthorns and earn a place in tomorrow’s (January 31) fifth round draw. Ricardo Santos is closed down by Sebastien Pocognoli and James McClean of West Brom. Photo: Joe Dent/theposh.com. New striker Shaq Coulthirst and substitute Jon Taylor scored the Posh goals after one-time Posh loanee Saido Berahino had twice given West Brom the lead. Westley said: “When Berahino scored his second goal I’d be a liar if I said it wasn’t a difficult moment for me, but I looked in my players’ eyes as they walked back to the centre circle and I felt we still had a chance. “All week we have talked about the desire and determination required to beome a succesful team and the players put it into practice today. They went about their work very impressively after conceding so late and we deserved the equaliser. “It’s a good result for us. I’m happy with that, but I’m happier with what a lot of young players will take from this match. They have come up against a quality team with quality players and a quality manager and acquitted themselves very well. Posh manager Graham Westley acknowledges the travelling fans after the draw at West Brom. Photo: Joe Dent/theposh.com. “To go toe-to-toe with players of Premier League standard and to know you have matched them should give these players lots of confidence for the season ahead and for their future careers. I’ve seen my team grow today. Westley made some surprising team selections for the tie. Michael Bostwick returned to the centre of defence with centre-back Jack Baldwin playing the first-half in midfield. Lawrie Wison also forced his way back into the starting line-up with regular right-back Michael Smith moving to the left side of the back four. Westley sent Taylor and fellow midfielder Martin Samuelsen on at half-time. “I wanted some extra experience on the pitch today,” Westley added. “We were understandably nervous coming into the tie, but the occasion was never going to get to a player like Michael Bostwick. “I made the changes at half-time quite simply because we needed a goal. I sent some attacking players on and Jon Taylor scored a cracking equaliser and Martin Samuelsen almost won it for us late on. West Brom manager Tony Pulis was generous in his praise for Posh. Pulis said: “Peterborough were brilliant today. They worked hard and passed the ball well. “To be honest I couldn’t see them scoring though. There weren’t many heart-in-mouth moments for me, but we made one big defensive mistake for their first goal and it changed the game. The replay will take place the week beginning February 8. 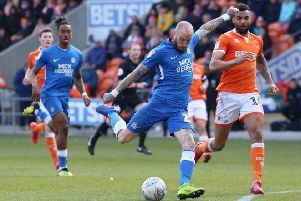 Posh have postponed their League One match at home to Oldham on February 9. The draw for the fifth round of the FA Cup will take place live on BBC 1 tomorrow (January 31, 6,15pm approximately).